Toward the end of the 18th century, the question of who controlled navigation rights on the Mississippi River--then the western border of the United States--became one of vital importance. France had originally claimed Louisiana, a vast tract of uncharted wilderness west of the Mississippi, but ceded it to Spain in 1762, prior to the 1763 Treaty of Paris. On October 1, 1800, Spain secretly transferred the land back to France. President Thomas Jefferson learned of the transfer in 1801. He sent Robert R. Livingston as U.S. Minister to France with instructions to negotiate for a port at the mouth of the Mississippi or, failing that, for permanent trading rights at the port of New Orleans. In January 1803, Jefferson dispatched James Monroe to France with an appropriation from Congress to buy New Orleans, as well as eastern and western Florida, if possible. 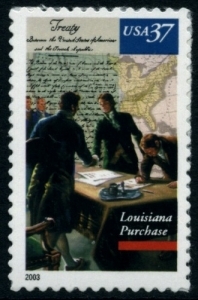 On April 11, the night before Monroe joined him in Paris, Livingston was informed that Napoleon was willing to sell the entire territory of Louisiana to the U.S. Aware that they were overstepping their authority, but worried that the amazing offer might be rescinded, Livingston and Monroe quickly began formal negotiations with Francois Barbé-Marbois, France's minister of finance. They agreed upon a price of $15 million, and in early May they signed a treaty to seal the transaction. The treaty was dated April 30, 1803. The U.S. Constitution did not stipulate either how the country could acquire new territory or who had the power to do so. Some Congressmen and other government officials questioned the legality of the treaty and, in fact, it was not even in keeping with Jefferson's own strict interpretation of the Constitution. Nevertheless, Jefferson saw clearly how the acquisition of Louisiana would greatly benefit the young country and realized that waiting for passage of a Constitutional amendment would jeopardize the purchase. Jefferson persuaded Congress to approve the treaty, and it was ratified by the Senate on October 20. On December 20, 1803, the United States took possession of its new territory at a ceremony in New Orleans. The vast territory of Louisiana was bounded on the east by the Mississippi River and on the south by the Gulf of Mexico, but no one, including the French, knew just how far west and north it stretched. Subsequent treaties settled the area at 883,072 square miles; defined the northern boundary as reaching to Canada and the western as running generally northwest along the Rocky Mountains to the middle of what is now Montana; and also surrendered the gulf coast of Mississippi, Alabama and Florida to the U.S.